Globalization is a complex and multifaceted phenomenon. It is best understood as a modern process as well as one with historical antecedents and continuities with past eras (Tazreiter and Tham 2013). From the contemporary perspective, it involves the intensified flows of capital, goods, people, images and discourses around the globe, driven by technological innovations mainly in the field of media and information and communications technology (ICT) and resulting in new patterns of global activity, community and culture (Blommaert 2010). Globalization has had a profound impact on the development of education worldwide. One of its impacts is in the area of educational language policy, which has a lot to do with the global spread of English brought about by globalization. Within the contemporary context of globalization, the global spread of English has been accentuated by agents of globalization, especially the neo-liberal ideology embraced by transnational corporations (TNCs) that use English as the in-house working language and the advent of ICT that relies on English as its operational language (Tan and Santhiram 2014). Both agents of globalization have increased the instrumental value of English in periphery-English countries, leading to the spread of English to these countries. For instance, in Russia alone, 50 million people are learning English. Meanwhile, English is the main foreign language in China (Watson 2000), and proficiency in this language is a key university entry requirement (Stanley and Lee 2011). What is worthy of note here is that the number of speakers of English as a second language (350 million according to one estimate) has exceeded the number of native English speakers (Nettle and Romaine 2000). Among other things, this spread of English is facilitated by increased emphasis given to English via educational policy intervention. In fact, a United Nations Educational, Scientific and Cultural Organization report (2002) notes that as the result of challenges arising from globalization, educational systems around the world are paying “special attention to foreign languages, first and foremost it is English” (cf. Rizvi and Lingard 2010, p. 176). Consequently, educational institutions become the sites where “the hegemony of the English language is spread, reproduced, but also contested” (Coulby 2005, p. 279). Since the political changes starting in 2011, the new quasi-civilian Myanmar government has announced a number of reforms to the education sector. For several decades before that, Myanmar had spent far less on education than any of its neighbours. When a government has failed to provide adequate education to enough citizens, many embrace decentralization as a strategy to improve their education system, often with the encouragement of international advisors and donors. The Myanmar government has stated that decentralization is a goal for their provision of basic education. It has also stated its intention to increase funding and the number of schools and teachers, increase the number of years of compulsory education, reform the curriculum, draft an education law, and reach out to non-state actors that have signed ceasefire agreements with the central government. Against this background of long-term underfunding and neglect, what is the nature of, and prospects for, decentralization in education inMyanmar? Can decentralization be effective in addressing the deep-seated problems in the Myanmar education sector? To explore answers to these questions, we have examined relationships within the formal education system in the Ministry of Education across various levels of government, from the national down to the state or region, and below that to the district and township. We describe the provision of education starting from the colonial era in the late nineteenth century through to the present. We have also reviewed some of the non-state actors involved in the provision of education, especially as their involvement throws into relief challenges that the formal education system faces. We then present our findings, which suggest that of this writing (2014), decentralization, to the extent that is has happened at all, is limited. The institutional culture of the Ministry of Education, together with societal attitudes towards education and perceptions of the proper roles of students, teachers, and Ministry staff, all limit decentralization. We have based our findings on a literature review and on interviews with key participants and decision-makers in two regions, Mon State and Yangon Region. The purpose of this review and interviews was to gauge how people involved with the provision of education understand “decentralization”, what decisions and responsibilities have been handed down from higher to lower levels of administration, and how they understand their own role in the process. Access to and quality of education have been key agendas of the Malaysian government to foster national unity and enhance economic growth. The First Malaysia Plan (1966–70) and the subsequent plans give much importance to education: “unless the education system is geared to meet the development needs of the country, there will be a misallocation of an important economic resource, which will slow down the rate of economic and social advance” (Government of Malaysia 1965, p. 163). The government allocates substantial financial resources to education annually, constituting about 17 per cent of the total public expenditure. The Malaysian Ministry of Education has worked closely with state and district education offices, international organizations (e.g., United Nations Children's Fund (UNICEF) and United Nations High Commissioner for Refugees (UNHCR)), and non-governmental organizations (NGOs), such as Child Aid Borneo and Human Rights Commission, to expand access toprimary schooling to all children. However, access to education remains lower for children who are poor, live in remote and sparsely populated area and without citizenship documentation. It should be noted that children without citizenship documents are not captured in the calculations of Net Enrolment Ratio (NER), and thus represents an additional population of out-of-school children and youth. The following sections will discuss patterns of primary school access and retention, quality and equity in Malaysia, and policies affecting access and retention in the sector. Figure 6.1 shows the primary school NER for selected years (indicated by dots) between 1970 and 1972 as well as between 1994 and 2005. This rate measures the proportion of children aged 7 to 13 who were enrolledin primary school. One notes that this rate was already relatively high in 1970 (84.3 per cent) and had increased to 96.2 per cent in 1994. Between 1999 and 2005, although minor fluctuations occurred, the percentage of primary school-aged children enrolled remained at or above 95 per cent but did not reach 100 per cent (with the highest net enrolment of 97.8 per cent, recorded in 2000). It is important to note that the figures — both the numerators and denominators of these percentages — exclude undocumented children (e.g., those whose parents are refugees or migrant workers), who face special challenges in gaining access to public schools. Internationalization of higher education has become a worldwide phenomenon that impacts education systems across contexts, countries and continents. The expansion of the internationalization process and its complexity is well illustrated in the evolution of academic attention paid to the definitions of internationalization. Arguably, the most acclaimed definition was given by Knight (1994) who defines it as the “process of integrating an international and intercultural dimension into the teaching, research and service functions of the institution” (p. 7). This working definition represents one of the first attempts to situate the internationalization process as a central part of every function of higher education institutions. Ten years on, the definition of internationalization of higher education was equated, to better include internationalization'svarying idiosyncratic characteristics; as “the process of integrating an international, intercultural, or global dimension into the purpose, functions or delivery of post-secondary education” (Knight 2003, p. 2). Note the inclusion of the “global dimension” and the changing terminology from “institution” to “post-secondary education”. This revised definition was intended to incorporate the growing diversity of the international process, which has indeed expanded in both its breadth and depth. To understand the internationalization of higher education and its relationship to policy change, Van der Wende's (1996) framework is useful. According to him, the internationalization of higher education could be viewed as a “process of educational change” that comprises of first-order and second-order changes. The first-order changes mean “those [changes] that improve the effectiveness and efficiency of what is currently done”, while the second-order changes alter the fundamental ways in which organizations are put together, including new goals, structures and roles. (Van der Wende 1996, p. 26) Internationalization of higher education can bring about both first-order and second order changes simultaneously. Examples of second-order changes include preparing students to join the international labour market, establishing special units to facilitate international cooperation and exchange, becoming partners in international alliances, and having performance assessed in accordance with international comparative perspectives (Van der Wende 1996, pp. 26–27, cited in Nilphan 2005, p. 39). Thus Van der Wende's definition of first-order and secondorder change can help researchers assess and analyse the level of policy “success” that internationalization has brought about. Prior to the era of globalization, education in Southeast Asia was viewed in the context of the national state and it was deployed in the service of state and nation-building and national economic development. States monopolized education, and public-funded centralized education systems were established to teach literacy, transmit national cultures and promote social cohesion, and to produce literate workers. Globalization forces, however, dramatically impacted in varying ways and degrees the national education systems across the region. As states begun to see their citizens as resources to enhance the countries' competitiveness in the global market, it, among other things, led to the increasing demand for highly skilled and qualified human capital. The accompanying neoliberal ideology led to varying degrees of decentralization, privatization and internationalization of education, especially of higher education, in Southeast Asia. 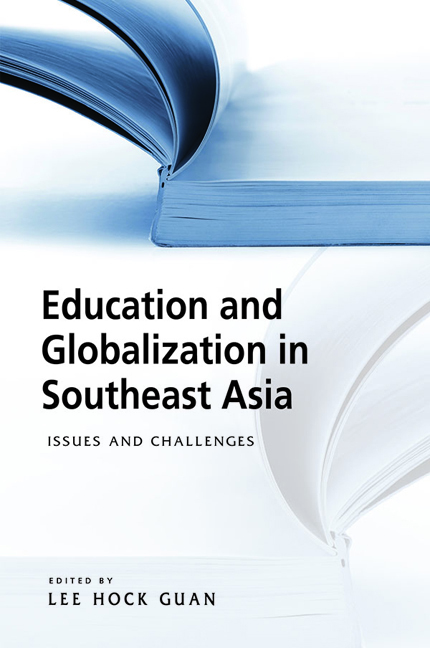 The chapters in this volume focus on a number of issues and challenges confronting the education sector in Southeast Asia, including: (i) the contrasting language in education policy in Singapore and Malaysia; (ii) the introduction of an English-medium private education sector in Malaysia; (iii) the internationalization of Thai higher education; (iv) access and quality issues in the massification of Malaysian higher education; (v) secondary school quality and higher education participation in Indonesia;(vi) equity, access and retention in primary school education in Malaysia; and(vii) reforms in the primary and secondary education in Myanmar. Singapore and Malaysia share a common history as colonial territories of the British. Each gained their independence from the British at around the same time, with the two countries even bound together as a single nation for a short period of time. Yet, if we examine the language policies of the two nations, we see a distinct difference in the paths that Singapore and Malaysia have taken in their approaches to managing linguistic diversity, and in their stances towards English. While Singapore has unambiguously embraced the utilitarian value of English and placed it as central to its language in education policies, Malaysia has, in many ways, been more Ambivalent and circumspect about the value and place of English especially in relation to Malay. In this chapter, we examine how their language policies have also sprung from very different sets of ideologies about language, which has meant that despite their common roots, Singapore and Malaysia have taken significantly divergent paths, resulting in very different outcomes or “fruits”. The chapter is organized in three sections. In the first section, we trace the historical development of English in Singapore; in the second, we examine that of Malaysia, followed by a discussion which compares and contrasts the language in education policies of these two countries. The Republic of Singapore is a relatively young nation, which celebrated only its fiftieth year of independence in 2015. Despite this, and the fact that it is a small island with no natural resources apart from its geographical position, Singapore has grown to become a thriving metropolitan country with a Gross Domestic Product (GDP) (adjusted for Purchasing Power Parity) per capita that remarkably ranks it as the third richest nation in the world (International Monetary Fund 2014). This outstanding achievement is no mean feat for a country less than half the size of London and which less than fifty years ago had a GDP that placed it as a struggling Third World nation. Among the many factors credited for Singapore's phenomenal economic success are its language policies, seen by the Singapore government as instrumental to its economic competitiveness (Ng 2008). Since Southeast Asian countries attained political independence, they have created “national education systems … as part of the state forming process which established the modern nation state” (Green 1997, p. 170). Framed in the context of the nation-state, education was tasked with the overlapping objectives of state and nation-building and national economic development. All states in the region nationalized and monopolized education and founded largely public-funded centralized education systems to teach literacy through the medium of a national language — in the case of Singapore, an official language — and to create a shared national culture by using a common syllabus. In recent decades, however, globalization, which has profoundly transformed the economic, social, cultural and technological processes and structures throughout the world, has also impacted in varying ways and degrees the national education systems across the region. How Southeast Asian countries should reformulate and restructure their education systems and which strategy they ought to adopt to prepare to adapt and deal with globalization clearly depended on each country's societal make-up and economic situation and level of economic development. How has globalization impacted and shaped the development of national education systems in Southeast Asia? In brief, globalization has brought about four interrelated changes to the education systems: (i) increasing demand for highly skilled and qualified labour; (ii) shifts in governance; (iii) privatization or commodification of education; and (iv) internationalization of education (Altbach and Knight 2007; Carnoy 2005; Robertson 2007). The emergent neo-liberal ideological paradigm accompanying globalization also dramatically altered the prevailing post-independent centralized governance and provision of education. In Southeast Asian states, in recent times the education sector has been subjected to varying degrees of decentralization and privatization or commodification. Moreover, the privatization of the region's education sector is occurring in the context of the growing internationalization of education, especially of higher education. Increasing global economic competitiveness and the emergence of the knowledge economy have raised the national, especially for more developed Southeast Asian economies, and international demand for tertiary-educated skilled and qualified personnel. While the scope, timing and pace of these transformations to the education systems differed in each Southeast Asian state, the main observable trend is the downscaling of state role in the governance and provision of education. Since independence in 1957, Malaysia has transformed itself from an agrarian to an increasingly industrial and globalized economy. Malaysia was formed in 1963 comprising Malaya, Sabah, Sarawak and Singapore, with the last leaving the group in 1965. In the country of 30-odd million, 62.1 per cent are Malays and other indigenous groups, 21.8 per cent Chinese, 6.5 per cent Indians and 9.6 per cent Others (includes 8.7 per cent non-citizens). Malaya and Singapore were served by the University of Malaya (UM), located in Singapore, until 1957 when a branch campus was established in Kuala Lumpur. In 1962, it split into two entities, University of Malaya and University of Singapore, as befits the two sovereign states. Formal steps were taken post-independence to develop higher education institutions to provide the high-level skills that the industrializing nation required. These aspirations took particular shape after the civil disturbances of 1969. Higher education in Malaysia expanded exponentially over the last four decades with dramatic improvement in access to public and private higher education institutions (HEIs). The factors contributing to increased access were primarily high secondary enrolment and completion, building on democratization and universalization of the system; an increasingly diversified institutional pattern of universities, colleges, polytechnics and community colleges catering to various levels of achievement; a burgeoning private higher education sector as a result of liberalization policies; and a combination of public and private sources in the financing of HEIs. This chapter examines current higher education policies and implementation in Malaysia, understanding their historical antecedents in relation to higher education access, equity and quality issues. The issues are analysed within the overall context of the need for well-qualified and highly skilled graduate participation in an increasingly globalized knowledge-based economy with the goal of reaching high income status as envisioned by Vision 2020 (Mohamad 1991). The key challenge is human capital growth. Underlying the discussion is the question: which policies and actions have worked, and which need to be reviewed and adjusted to ensure that the nation's talent pool will match the demands of a high income, knowledge economy? The study draws heavily on government documentation issued by the Ministry of Education (MOE), the Ministry of Higher Education (MOHE), and the Department of Statistics, particularly its Census Reports and Labour Force Surveys. Data provided by officials and politicians to the press have been included. Most research on school choice and academic achievement focus on the outcome in terms of either standardized exam scores or upper secondary graduation. However, instead of using these measures some economists place more emphasis on higher education attendance as an indicator of school performance. Using various methods, numerous studies have analysed the effect of school choice on secondary school and higher education or college attendance. A significant proportion of these studies focused on and evaluated the performance of Catholic, private and public secondary schools. Some studies in developed countries have found that Catholic or private schooling has a positive effect on academic achievement or earnings. Evans and Schwab (1995) found that attending a Catholic high school increases the probability of graduating from high school or participating in a four-year college course by 13 percentage points. Likewise, Neal (1997) found that urban minorities beneﬁt greatly from attending primary Catholic schools as their probability of high school and college graduate rates increased. Vella (1998) also found that, despite the tuition fee being relatively low, attending an Australian Catholic School increases the probability of access to higher education and higher earnings. Using a quantile regression approach, Eide, Goldhaber and Showalter (2004) found that students attending a Catholic high school in the United States will more likely lead to attendance at a selective four-year college relative to students attending public high schools. Altonji, Elder and Taber (2005) developed a new technique of assessing selectivity bias in the absence of valid instruments based on measuring the ratio of selection on unobservable variables to estimate the effect of attending Catholic school on college attendance. They found that Catholic high school attendance substantially increases the probability of college attendance. However, other research have found contradictory evidence. Akabayashi (2006) shows that in Japan public schools outperform private schools on college attendance rates when competition is increased. Cappellari (2004) found that general high school attendance increases the probability of access to university, whereas private high school students have lower academic performances. Similarly, Stevans and Sessions (2000) found that school choice has different implication for white, black or Hispanic students, as school choice is mostly taken advantage of by white urban residents. Moreover, white students perform better in private schools than in public schools, whereas a performance gain for private school minority students is found to be signiﬁcant. Many of the factors that determine success in school stem from the period before children enter primary school. During this period the central nervous system and brain cells develop and neural pathways are established, laying the foundations for a child's future pathway through life (Irwin, Siddiqi and Hertzman 2007). Although children's later experiences can still change those pathways, developments in early childhood have long-lasting effects on health, behaviour and learning outcomes for years to come (Grantham-McGregor et al. 2007; Mustard 2007). Children whose early learning and development are promoted are likely to be far more engaged, productive and successful in later life (Heckman 2008). The available statistics show big disparities in developmental outcomes for children in Indonesia both at an early age and in primary school, although there is a lack of data for children aged 0–6. Indonesia's maternal mortality rate fell from 340 to 220 deaths per 100,000 live births between 2000 and 2010, but remains far above the 2010 average of 83 for all developing countries in the East Asia and Pacific region. Similarly, the under-5 mortality rate fell from 54 to 35 deaths per 1,000 live births between 2000 and 2010, and the infant (under-1) mortality rate from 38 to 27, but both remain well above the 2010 regional averages of 24 and 20 respectively. Births attended by skilled health staff, immunization rates and rates of access to improved sanitation facilities are also below the averages for all developing countries in the East Asia and Pacific region. Moreover, an estimated 42 per cent of rural households have children whose growth is stunted, putting them at risk of long-term cognitive deficits, emotional and behavioural problems, and low school achievement. Indonesia can pride itself on having primary school enrolment rates that are now close to 100 per cent for both boys and girls at all income levels. At higher levels of schooling, however, disparities emerge. Educational attainment profiles reveal that although almost all children from all segments of society start primary school, children from poorer households and those from rural areas are less likely to progress to higher levels of education. Only 55 per cent of children in rural areas make it to junior secondary school and less than a quarter to senior secondary school. 4 - Integrating Islamic Schools into the Indonesian National Education System: A Case of Architecture over Implementation? Indonesia's education system is the fourth largest in the world. Although data on the exact number of Islamic schools (madrasah) in the country differ, the Ministry of Religious Affairs claimed to manage about 45,000 in 2010. More than 90 per cent of these were private schools, many of them set up by local communities or major Islamic civil society foundations in the absence of state-sponsored alternatives. Although there are important exceptions, the majority of private madrasah have a lower income base, fewer resources and poorer facilities than the state-funded schools, and thus deliver a significantly lower standard of education. They are disproportionately represented in remote or disadvantaged areas and generally have higher proportions of poor students and girls than their state school equivalents. Private madrasah, funded primarily by their communities, deliver the mandatory nine years of basic education to around 6 million students: 3.5 million in 22,000 Islamic primary schools (madrasah ibtidayah) and 2.5 million in 14,000 Islamic junior secondary schools (madrasah tsanawiyah). Two national ministries are responsible for education: the Ministry of Education and Culture, which has overall responsibility for the public schools; and the Ministry of Religious Affairs, which operates the faith-based schools. The two systems run parallel to each other; they both teach a core curriculum of general subjects, supplemented in the case of the Islamic schools by an additional 30 per cent or so of religious education subjects. This means in practice that few Islamic schools have the capacity to teach the full curriculum of general subjects, although some cope with the additional load by teaching religious subjects in afternoon sessions outside school hours. The duration of schooling is the same for both the public and faith-based school systems; they offer six years of primary education, three years of junior secondary education and three years of senior secondary education. However, the graduation certificates issued by unaccredited madrasah are not recognized as a qualification for continuing education, and madrasah student participation in external national examinations is not automatic. To some extent, these deficiencies have been addressed by the establishment in 2007 of a national board (BAN-S/M) providing uniform standards of accreditation for all schools. In Indonesia, as elsewhere in Asia, education will inevitably play a key role in the national development experience as the twenty-first century unfolds. Not much international attention is paid to how the education sector is faring in Indonesia, but that is not because nothing is happening. The past decade has seen major changes in the structure of the education system and in the schooling trajectories of Indonesian children and adolescents. The administration of primary and secondary education has been decentralized to the regions. A new paradigm of school-based management has been introduced. Public spending on education has finally reached one-fifth of total government spending, as required by law. 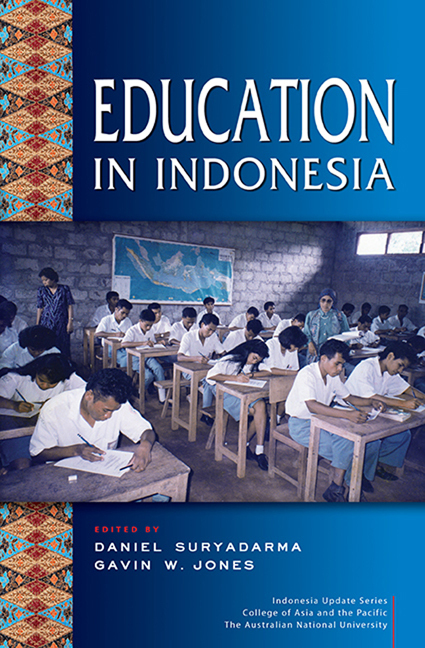 But although enrolment rates at all levels continue to increase, the quality of education remains low and has not improved, and the tertiary sector continues to experience problems of autonomy and unsatisfactory performance.This book delves into the major developments in education in Indonesia. Drawing on the expertise of some of the most knowledgeable people in the field, it identifies the challenges facing the sector and offers recommendations on how these challenges could be overcome.